(Newser) – Color us shocked. Infamous "pharma bro" and Internet villain Martin Shkreli appeared to endorse Donald Trump for president in a series of tweets Thursday, Reuters reports. “I support him vs. Hillary," Shkreli tweeted. He added: “All you people who don't like Trump are jealous, stupid, and poor!" That's the Shkreli we've all come to love to hate. 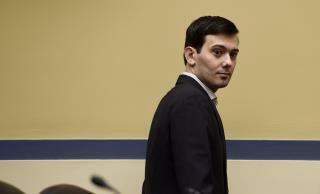 In between jacking up the price of a drug used by HIV patients by 5,000% and getting arrested on charges he defrauded a pharmaceutical company, Shkreli has called US representatives "imbeciles," publicly threatened to beat up a high-schooler, expressed regret for not raising drug prices even higher, and paid $2 million for the only copy of a new Wu-Tang Clan album. But it appears Shkreli's endorsement may have been just another attempt to troll the public. Mission accomplished. I am not surprised! If elected does Donald Trump intend to appoint him as Secretary of Health and Human Services? Wow! Donnie gets all the good ones! I take that story with a grain of salt. He probably put his endorsement up for highest bidder and the Dems won.